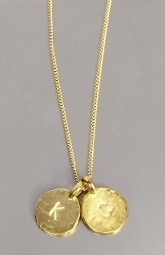 Pick any two Initial Pendants on a single 26" Chain. silver and plated in 18K Yellow Gold. Chains are 14K Gold Filled over sterling silver. and contact with any chemicals. Note: For international orders, customs fees may apply to recipient. Amount may vary depending on country.